The Jangid family lives in the city of Jaipur in the state of Rajasthan, India, an area that for centuries has been known worldwide for quality, elegance, design, ethnic flavour and unmatched workmanship in both utilitarian and artistic wooden masterpieces. Using the simplest tools, these artisans - father Mahesh and his sons Mohit and Rohit - faithfully adhere to the style of their forefathers, which has helped to keep the tradition of miniature carving alive. Learning to carve with precision and exactness on a miniature scale is challenging for even the most seasoned carvers, but for 45-year-old Mahesh and his sons, Mohit - 22 - and Rohit - 20 - it is a lifelong labour of love and an honoured family tradition passed down through many generations. Mahesh was born in Churu District, Rajasthan. He learned the art of woodcarving at the age of seven, under the tutelage of his grandfather, Shri Mal Chand Ji - a nationally recognised woodcarver and National Award winner. After a basic education, Mahesh gave up studies to devote his life to sandalwood (Santalum album) carving and by the time he was 24, Mahesh had earned his own national carving award for his extraordinary miniature work. 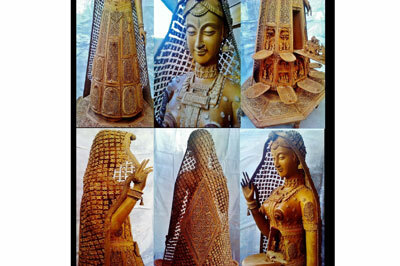 In 1993, he won the National Award for his sandalwood carved hand fan and his extraordinary achievements, due to the high quality of work and the efforts needed to carve each piece of work. 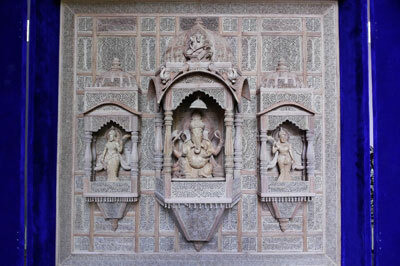 Now living and working in Jaipur with his sons, Mahesh has devoted his life to this unique art form. He has shared his passion and techniques with his two sons and they too have gone on to win multiple awards and recognitions for their carvings. 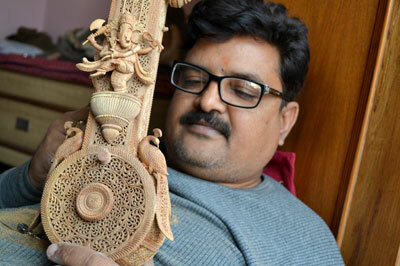 Mahesh has broken a number of records with his work, when he carved his fine, delicate smallest jointless chain from a solid piece of sandalwood. The chain is 315mm in length and weighs just 160g. He has also since carved one more jointless chain from another solid piece of sandalwood, this time with the chain measuring 10ft long with 496 links and weighing just 12g, which is the longest wooden jointless chain. 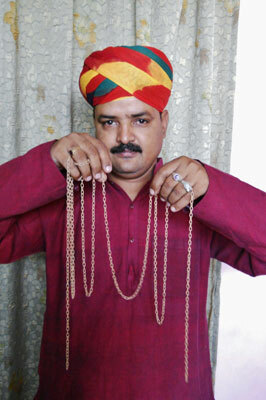 Mahesh has two records in the Limca Book of Records for making these jointless chains and also has a record in the Indian Book of Records and one record in the Global World Record for the same pieces. To promote his work, Mahesh participates in national art and crafts exhibitions and fairs, such as Delhi Haat, Suraj Kund Mela, Master Creations Delhi, etc., but he also participates in international art exhibitions and fairs in France, Germany, Egypt, Malaysia, Poland, Switzerland and more. Mahesh looks to his sons taking on the family tradition and tells us: "I feel so proud of both of my sons for following our traditional carving techniques. They are so dedicated to this work and are very creative. They are always thinking about how to make their carvings more attractive and beautiful. So I think they both will do much better in their lives." Mohit was born in Jaipur, Rajasthan and was initiated into the craft at a very young age. Since graduating and leaving school, he has also chosen to dedicate his life to woodcarving, having already done it for 15 years. He feels strongly that the Jangid family have a woodcarving talent and knows that he would rather spend his life learning and developing that skill than taking on a job he dislikes and 'wouldn't have respect for'. Mohit tells us he is 'addicted' to his work, so feels he and his brother can do much better in life with woodcarving, than in a job with 'limits': a 'limited salary', 'limited time' and 'limited work'. Woodcarving, on the other hand, is limitless - it's up to the two brothers to find new things to carve, new designs and more miniature work. Mohit tells us: "I do prefer miniature because I've seen this type of carving from my childhood and miniature work is the most important thing in our work, because it makes our items more attractive. We can make all kinds of carved products, but miniature carving is my favourite. I give my best to this carving work and I always enjoy it." His knowledge of epics and religious texts has helped him bring a rare blend of beauty and craftsmanship to his creations. Like his father, Mohit is no stranger to awards and records. He has previously received the State Award 2008-09 by Rajasthan C.M. Shri Ashok Gahlot for Excellence in Sandalwood Carving. He also holds a world record for the 'smallest playable violin' and two national records for his smallest in size violin. This remarkable piece is just 130mm tall and 19mm tall. The item is exactly to scale and performs the same function as the everyday, original violin, usually with four strings. Rohit was also very young when he began to learn the traditional art of miniature carving from his father. Unlike his brother, Rohit is still studying. Although near graduation, he cannot dedicate to carving full-time just yet. He does, however, have a record in the Indian Book of Records for making a wooden house-fly and some national and local records for the same piece. In order to get his work seen, he participates in national and some local art and craft exhibitions. Rohit tells us: "I like miniature work in my art and we - the Jangids - are the only people who make these kind of carving products with scenes in flipped lids. All scenes have their own story." Rohit loves it when people are surprised as he shows them his work and then he opens the lids, to scenes they don't expect to see in such tiny shells. 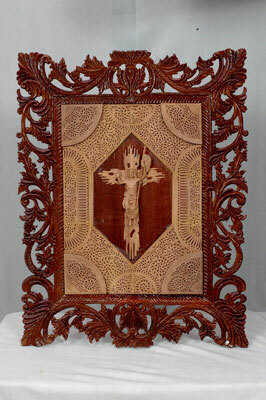 "Miniature carving involves engraving the wood on the contours of the design with the utmost care. We make many of our own small tools according to our needs: small iron sticks, knives, chisels and some tools for filing," he tells us. Looking to the future, he continues: "We work at home, so I will definitely teach this work to my future children and then, if they want to go with any other profession, I will support them." Rohit tells us that he also had the choice to take another profession, but he picked carving for his life's work. He feels that if people are forced to do a profession they can't do to their best ability, it's best to teach them a skill and then they can continue the work if they want. Should his children want to do otherwise, Rohit tells us he will always be there to support them. Mahesh and his sons draw inspiration for their miniaturised wooden carvings from history, mythology and day-to-day life in India. Their work is accomplished with the most basic and often handmade tools applied with the meticulous care of a filigree artist. The most typical woods used for ornamental and inlay work in India are walnut (Juglans regia), rosewood (Dalbergia latifolia), ebony (Diospyros spp. ), teak (Tectona grandis), sal (Shorea robusta) and sandalwood (Santalum album). The Jangid family works almost exclusively in sandalwood, due to its malleable characteristics and delicate natural fragrance. Mahesh explains: "Sandalwood is the most conducive medium for our particular craft because it is softer than most types of wood and easier for us to work with." Their highly intricate designs are created by using a combination of carving methods, such as deep carving, shallow carving, latticework and fretwork on a nearly impossible miniature scale. In fact, each carver has a place in the Limca Book of Records for their miniatures. Mahesh for his tiny 91-link woodcarved chain; Mohit for the smallest playable violin and Rohit for the smallest carved house-fly. In addition to their individual carvings, they collaborate together on many of their projects: "All three of us work together as a team," Rohit tells us, and he explains that they list the price of their pieces from $200-1,700. One of the unique aspects of the work that Mahesh and his sons produce are the pockets that pull out to reveal tiny figurines and vignettes inside: "We are the only ones here who make carvings with miniature scenes in flip out compartments," says Rohit. "I like how surprised people are when I open the lids and show them these tiny scenes. They don't expect something like that." Mohit enjoys making the miniature scenes the best: "I think the addition of these miniature carvings is most important to our work because it makes all of our items more interesting and attractive." The Jangid family are not only woodcarvers, however, but also skilled in the art of 'tarkashi' - inlay work on wood. In each cubic centimetre of inlaid work, up to approximately 250 pieces of metal and wood are laid side by side. Inlaid articles in the Safavid era took on a special significance as artists created their precious artworks. These works include: doors and windows, mirror frames, Quran boxes, inlaid boxes, pen and penholders, lanterns and inlaid ornamented shrines. One of the family's most detailed works is a village scene, called 'Ashram'. The Ashram is a story about Shakuntala, the story of Dushyanta's marriage, separation and reunion with his queen Shakuntala. The sandalwood miniature is a completely hand-carved, decorative item, standing at 460 x 305mm. 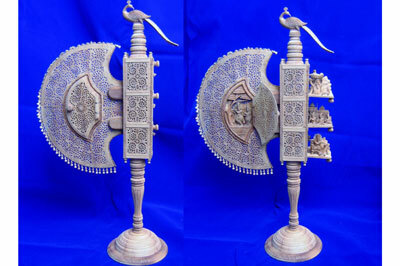 Another extremely impressive piece, is the 'Rajasthani hand fan'. 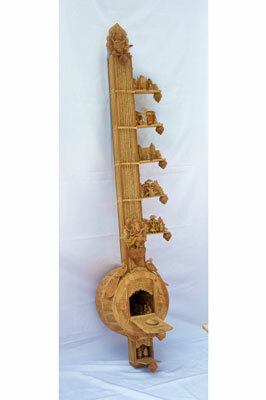 Again, made of sandalwood, it is an Indian implement used to induce an airflow for the cooling purpose. This, however, like the rest of the family's work, is a miniature carved decorative item. The fan also hides some scenes within the piece. With small fold-out sections, the scenes are based on Lord Krishna's life story - the peacock on the top gives a pure Indian look. The tiny scenes consist of Shri Vashudeva crossing the river to save baby Krishna's life, Shri Krishna eating butter with his brother Balarama and Shri Krishna dancing on Kalia Nag. This miniature stands at 510 x 305mm. The Jharokha, a type of overhanging enclosed balcony used in Indian architecture, is only 660 x 710mm. This type of balcony is typically used in Rajputana Architecture, Mughal Architecture and Rajasthani Architecture. Jharokhas jutting forward from the wall plane could be used both for adding to the architectural beauty of the building itself or for a specific purpose. One of the most important functions it served was to allow women in purdah to see the events outside without being seen themselves. When asked what he likes most about this work, Mahesh replies: "I enjoy all the carving that we do, but I would have to say that carving the 'Rajasthani Doll' was my most favourite project. This piece shows the beauty of the Rajasthani lady with our traditional jewellery and it tells the story of Rajasthani freedom fighters." If Mahesh was ever concerned that his sons might not continue on in the family carving tradition, he can lay those fears to rest. Both sons say they would not want to do anything else. Mohit, who recently completed all of his formal education, says he plans to stick with carving: "I will continue to do this work for the rest of my life because carving has no limits. How much we do and how far we go is all up to us," he says. "I like that we always get to do new things, new designs, more miniature work, etc. I would not have this kind of freedom with any other job. I am absolutely addicted to my work and so happy that I have the talent to do this."